Ready to always know what’s happening with the reparations for plantation slavery movement? Would you like to save time when it comes to researching reparations news, events, and more on the web, and be able to get involved and voice that you’re in favor of reparations when events happen?! 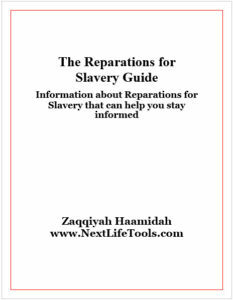 “The Reparations For Slavery Guide” can show you exactly what’s happening with reparations for plantation slavery movement on a daily basis, help you find news, events, and more on the web quickly, and give you the quickest route to voice that you are FOR reparations when your voice is needed. …but, it is available NOW for an introductory price of $7.